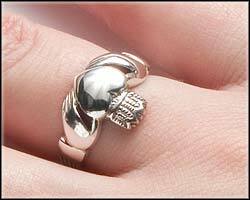 Traditionally, Claddagh rings were worn in Ireland to show marital status – a tradition that still continues today. The hand on which the ring is worn, as well as the direction that the heart faces, will tell observers if the person is open to love, in love, or married. There are a few different ways how to wear a Claddagh ring, depending on what you are trying to tell people. When worn in this manner (heart closest to the fingernail), it means that a person is willing to consider love or a relationship. The person is showing the world that their heart is open to love, as it has not yet been won over. 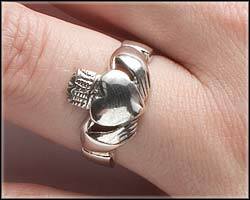 Claddagh rings can be worn by both the male and female. Once a person has entered into a relationship, the Claddagh ring remains on the right hand, but is turned so that the heart now faces the wearer. This is a statement that your heart is now taken, and no longer open to others. The Claddagh ring makes a perfect engagement ring. This method of wearing is also used by those who are simply not interested in starting a relationship at the present time. Once married, the ring is then placed on the other hand and worn with the heart facing the wearer. This shows that two hearts have now been joined together forever. 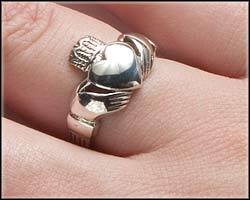 In this manner, the Claddagh ring can be worn as an Irish wedding ring. Placing the Claddagh ring on the left hand is often a part of an Irish wedding ceremony for both the man and the woman. Although very familiar to some, the term Claddagh is not the easiest to spell – particularly when the only experience might be the spoken word. Even internet search engines do not always know what it is that we mean! We often see very simple misspellings such as cladah , cladagh, or claddah, or claddaugh (very common), clauddagh or cladaugh. Sometimes, the misspellings are a little more inventive and we notice people searching for cladder, clatter, claudia or clauda rings. The important thing about the Claddagh ring however, is not how you spell it. It is remembering the symbolism of Love, Loyalty and Friendship that the ring represents, and the heritage that it symbolizes.